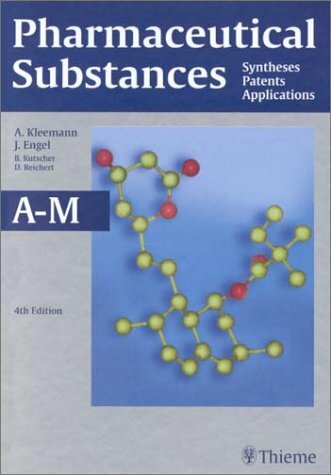 Pharmaceutical Substances 4th edition has been revised and expanded to include an additional 96 pharmaceutical compounds, providing a compendium of over 2200 pharmaceutical ingredients of interest to the pharmaceutical and chemical industry. It is essential as a first point of reference not only for specialists in drug chemistry but also for anyone involved in the marketing, sale and use of pharmaceuticals and pharmaceutical ingredients. Of added value are the indexes of compound classes, intermediates, trade names and enzymes, microorganisms, plants and animal tissues. Pharmaceutical Substances is designed to be a complete reference guide to every pharmaceutical compound of significance. It is essential as a first point of reference not only for specialists in drug chemistry but also for anyone involved in the synthesis or use of pharmaceuticals. This reference work describes the production/isolation processes of about 1300 active pharmaceutical substances (including the syntheses of their intermediates) that are or have been marketed. In order to illustrate what particular information can be drawn from the book a typical monograph is depicted and labelled. Frequently-used abbreviations are explained in a separate list. With respect to the names of reagents and intermediates in the course of the syntheses the authors tried to use the names found in the catalogues of the commercial providers of fine chemicals, e.g. Sigma-Aldrich, otherwise the Chemical Abstracts Names are given. In addition, to the respective patents and publications in journals several standard reference books for Pharmaceuticals and Fine Chemicals were used and sometimes also cited.